Wed, Mar 20, 2019, 08:27 pm SL Time, ColomboPage News Desk, Sri Lanka. Mar 20, Geneva: Presenting the report on Promoting reconciliation, accountability and human rights in Sri Lanka to the 40th session of the UN Human Rights Council in Geneva on Wednesday (20) UN High Commissioner for Human Rights Michelle Bachelet called on Sri Lanka to implement a detailed, comprehensive strategy for the transitional process with a fixed timeline. 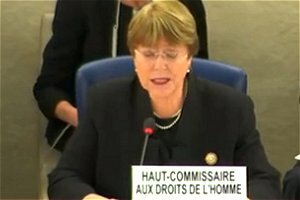 Acknowledging the Sri Lankan government's open dialogue and sustained cooperation with the OHCHR, Bachelet welcomed the operationalization of the Office of Missing Persons (OMP) and the establishment of the Office for Reparations and encouraged the government to enable the two institutions to "function effectively and independently", and to link them to a broader approach aimed at justice, real accountability and truth-seeking. Welcoming Sri Lanka's commitment to implement Human Rights Council resolution 30/1, the High Commissioner said however, implementation of resolution 30/1 needs to be more consistent, comprehensive and accelerated. The High Commissioner said a contributing factor to delays appears to be a lack of common vision among the country's highest leadership and deadlock on these important issues has a damaging impact on victims from all ethnic and religious groups and on society as a whole. She said the recent appointment to a senior position in the Sri Lankan Army of Major General Shavendra Silva, implicated in alleged serious violations of international humanitarian and human rights law, is a worrying development.